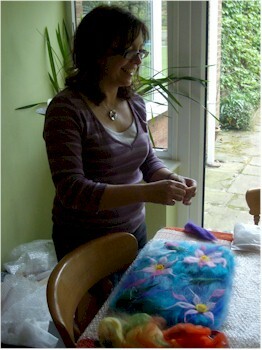 There are many ways of creatively using felt, either artistically or practically. Felt can be use to create the finest gauze-like material or so strong it can be made into three-dimensional objects, either solid or hollow. On an artistic level felt can be used for wallhangings, as a back-drop for hand or machine embroidery, and three-dimensional sculpture. Felt can also be used on a practical level for clothing, handbags and footwear.